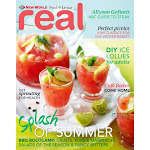 Recently Vanessa and I were commissioned to style and take some photo's for a fabulous magazine called NZ Life & Leisure. 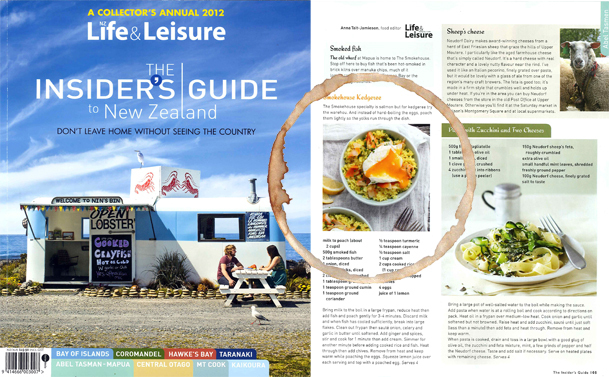 Each year they put out a special title and this year it was The Insiders Guide to New Zealand showcasing NZ's top spots to visit for food, where to stay, people to meet and things to do . I thought it would interesting to share our experience and also one of the recipes from the day, that we tucked into with gusto. THE BRIEF: To photograph four recipes (Kingfish Tartare, Kedgeree, Chargrilled Lamb Steaks with Smoky Capsicum Salsa and Avocado Salad) in a relaxed casual style making sure it was a good fit with the other recipes in the magazine (which were stock images from a variety of photographers and stylists) and also to compliment the colours used in each section of the magazine. 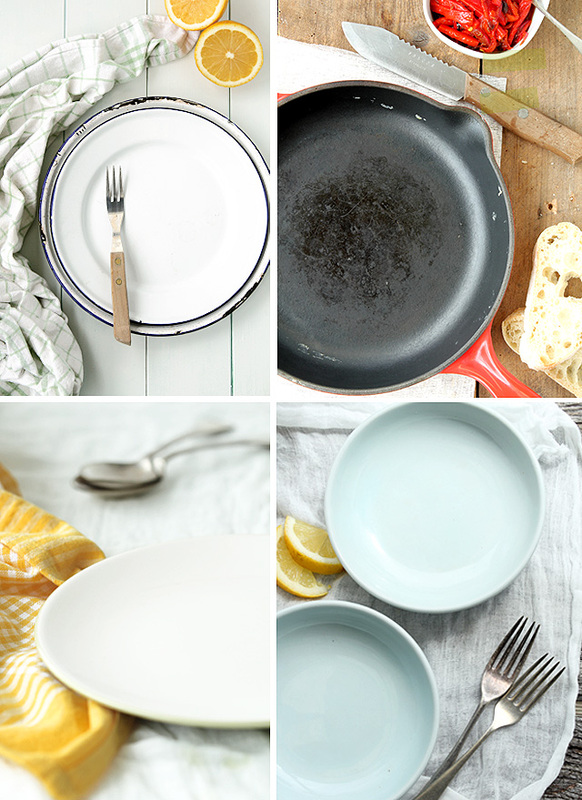 What plates, cutlery and props to use? Our setups before the food arrived. We decided to keep it very simple, with muted colour and let the food be the focal point. We choose to shoot above if the food was quite flat, and we choose a 3/4 front on angle if the food could be piled high. PROPS USED: Muslin cloth (great for creating a relaxed style, as the edges of the muslin roll up which create a nice subtle effect, old enamel plates - different sizes stacked on top of each other, old wooden boards, white painted wooden boards create a marine/ seaside feel to the shot especially good if your photographing seafood, red fry pan to compliment the capsicum salsa and to add colour as meat (Lamb steaks) can sometimes be quite dull. Lemons cut in different ways always add a freshness to a dish. 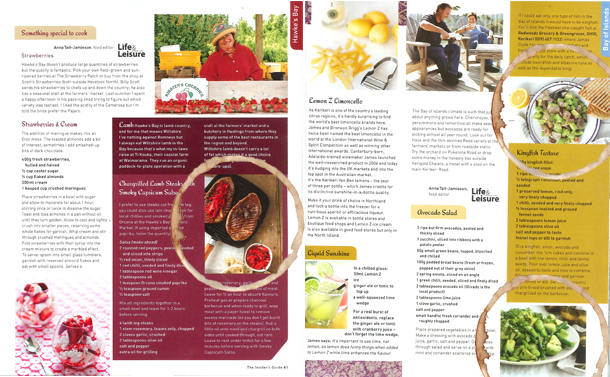 The recipes were supplied to us, so make sure you double check you have all the right ingredients showing in the photo. 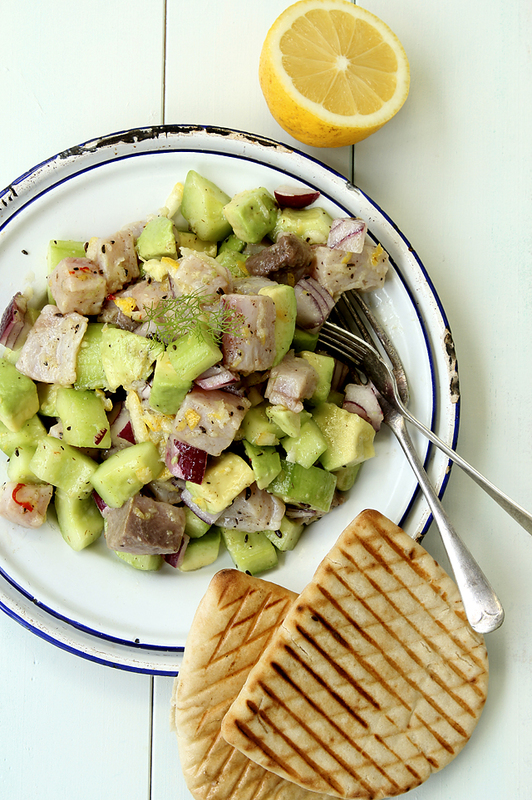 An avocado salad ain't an Avo salad if you forget the AVO! CAMERA USED: Canon 550D - shooting in RAW and JPG - As the photos are retouched in house we supplied both RAW and JPEG files on disk to the Art Director with minimal retouching, only a bit of contrast. No sharpening. SHOOTING FROM ABOVE: Used the standard kit lens 18-55mm. ISO: 100 f:11 We always had an aperture of 11 as this is the best aperture to have everything in focus. Kingfish Tartare: Old enamel plates and boards painted white add to the seaside theme. We choose two dishes each and shopped and prepared each one at our own house - cutting up chillies or chives, cooking rice - anything that could be made ahead of the shoot. We decided to shoot at Vanessa's house, on her front porch as it was a bright but overcast day - perfect for photographing food. As Vanessa is definitely the better cook out of the two of us - she took over the cooking, and styling of the food whilst I went ahead and set up the different props and table settings, set up the camera, reflector board and tripod. It was a very simple setup, as the light was perfect. I did a white balance using a white card and holding it in frame and setting it in my camera, which I did at various times throughout the day as the light changed. We had some very 'blonde' experiences, and the wine wasn't even opened yet! We forgot the Avocado in the Avocado salad, we kept saying, 'what a weird looking salad', 'how bland', 'only broad beans? ', 'not very appealing' and shot a few frames before it dawned on us what we had omitted. We also didn't realise that broad beans needed to be popped out of their shells - and again took a lot of frames with them looking grey and lifeless. Re read any recipe you are commissioned to style or photograph - if you forget anything important, your shoot is ruined! Be decisive. Don't take truckloads of photos of the same setup. Take three at different apertures, and move on. You will appreciate it at editing stage. Get it right in camera. Make sure your lighting is right and no random crumbs, spots or dribbles are showing. Again, you will appreciate at editing stage, not having to clone out horrible fingermarks you didn't remove when you could. Best dish of the day: Thumbs up to Anna Tait - Jamieson (Life & Leisure's Food Editor) for creating this very exciting dish - a great blend of flavours and textures. We hope we did it justice in our photographs. Bring milk to the boil in a large fry pan, reduce heat then add fish and poach gently for 3-4 min. Discard milk and when fish has cooled sufficiently, break into large flakes. Clean out fry pan then saute onion, celery and garlic in butter until softened. Add ginger and spices, stir and cook for 1 minute then add cream. Simmer for another minute before adding cooked rice and fish. Heat through then add chives. Remove from heat and keep warm while poaching the eggs. Squeeze lemon juice over each serving and top with a poached egg. Great post & fantastic photos....that egg is perfect!....here's hoping it leads to lots & lots of photo shoots! We were very proud of the egg!!! We had to shoot really quickly, one cutting the egg and the other on the camera! The meal tasted great too. What a great experience - must have been a very exciting day for you both. Love the shots and styling and thanks for the tips. Very informative, well done, +1! and I love the cup stain circle to highlight the photos :-)! How fantastic to be commissioned to do this work. Looks like you did a fantastic job. Hope lots more come your way. Congratulations on the commission - and it looks as though you did a fantastic job. Your photos are fabulous, and really love all the great tips and good advice. 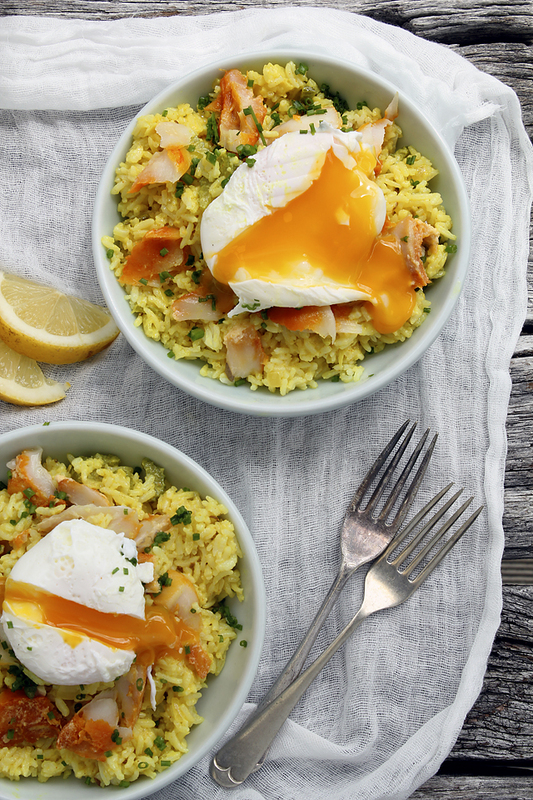 That kedgeree looks divine - will definitely be trying that - and what a perfect egg. I would be pleased to cook an egg so perfectly, let alone photograph one. Well done. Thanks for the technical tips, they were really helpful! Love the final "products" too :) Also I'd never thought to arrange the plates etc before the food, what a great idea! Glad to find another amazing NZ food blog. Hi, Like the Brownie or Scout motto...."Always be prepared" It's been the best advice - otherwise your food gets cold, looks limp and dull whilst your trying to figure out what plate works best, what colour napkin etc before you've even taken your first photo. It also makes for a stress free shoot!